I grew up believing in Karma. Kind of from my Sunday school teaching Grandma. Now I know that Karma and Christ are two different types of beliefs. But my grandma always taught me that what you put into the world is what you get out of it. And that you should do for others without the expectations of anything in return. Thats just the godly way. Thats also kind of like Karma. The more good Karma you put out is the kind of Karma you are more likely to attract. However, if you’re a Negative Nancy…then that is all you’re going to attract. Some people only do good things so that others will give them something in return…. To me that is wrong. That is not how you put good karma out into the word. That’s like sending good vibes with a negative note attached at the end. It’s still negative. Personally, I will help anyone until I feel that I am being take advantage of. And it usually takes me a while to feel like someone is using me. when I do help someone… I never expect anything in return. I actually feel weird when others do anything for me.. or give me anything. I am not good at receiving anything. even on my own birthday. Just by doing something good and having positive energy is enough. I try to tell anyone I help to pay it forward…do something nice for someone else. I wish everyone would send out positive energy because it could change the world. 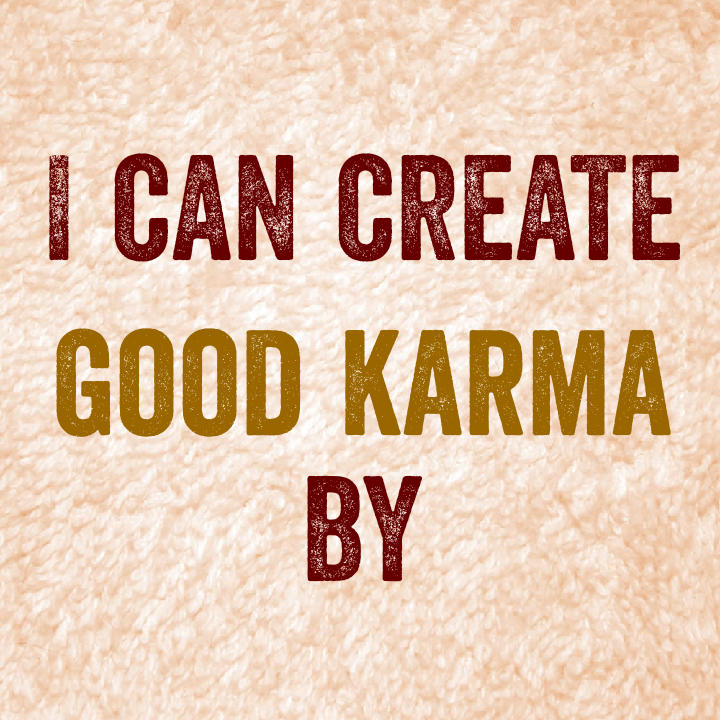 What are some ways that I can create good Karma? Well it doesn’t have to be anything extravagant. I can do small things like smiling and talking to the cashier because you never know what kind of customers they have had. Not cutting in front of anyone. Letting someone with less items go ahead of you. Especially if they’re carrying a bunch of stuff in their arms. Opening the door for someone. Picking things up if someone dropped them. There are just so many small things that you can do to create good karma in the world. You never know, maybe one day you’ll need someone’s kindness.